Desired for its strength and durability as well as consistent grain patterns, Appalachian Hardwood sets the standard for thousands of products and materials across the world. With over a dozen species of hardwood available, including Red Oak, White Oak, Walnut, Poplar, Hard Maple, Soft Maple, Ash, Cherry, Basswood and Hickory, hardwood from the Appalachian region is a resource that manufacturers have learned produce the finest wooden goods. Since the 1920s when hardwood from the Appalachian region began to make a name for itself, the term Appalachian has come to mean a consistency that is unmatched. Spanning from Georgia to New York, the Appalachian region is a temperate garden spot for hardwoods, with nutrient rich soil, idealistic year-round temperatures, and the perfect amount of moisture, allowing hardwoods to grow to their fullest potential. Appalachian Hardwood provides you with a superior, long-lasting resource at minimal environmental risk. Modern forest management and wise utilization is at the forefront of our sustainable agenda, and our efforts have played a role in adding 300,000 forested acres to the Appalachian region. Now, more than a billion trees have been added to the region since 2007. 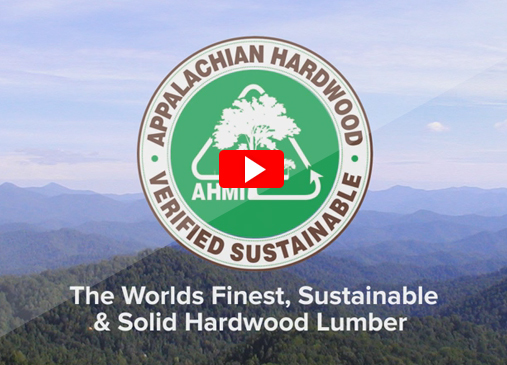 Appalachian Hardwood Manufacturers members are eligible for Certified Appalachian Sustainable and Legal which is a third-party audit of sourcing timber products from the region to meet the standards adopted by the AHMI Board of Trustees. Appalachian Hardwood Verified Sustainable assures consumers that lumber and products sourced from the region are growing 2.4 times the rate of harvest and mortality combined. This is based on US Forest Service Forest Inventory Analysis. Appalachian Hardwood companies can prove the Verified Legal status of timber resources through documents signed by landowners, loggers an others in the supply chain.